Heiko Plate, webmaster of hpmusic, has created a number of programs that have become very popular in the Yamaha community. Many of these are summarized in the table below. If you visit his web site, you will also find a number of articles, tips and tricks, and songs that you can read or download. Information on the site is available in German and English. Click on any program name to go to Heiko's site for a more detailed description and to download the program. Click on the screen-shot to see a larger image. PSR Utility (PSRUTI) is a tool to tune midifiles of the standard formats SMF0 and SMF1 to be used at Yamaha XG/XF synthesizers, in particular keyboards. The program performs most of the standard functions of sequencers in a more easy way. All special features of Yamaha XG and XF are considered contrary to manufacturer independant software programs. Displaying the properties of registrations on screen. Generating a file showing the properties of all registrations in an archive, including title, style, bank-numbers, place-numbers, tempo and voices. The program can create html (.htm) or text (.txt) files. Generating individual files for each separate registration in an archive. Registrations are displayed in alphabetical order, giving the performer an opportunity to create a sorted list of all songs in the repertoire. Copying registrations from a source archive or set of registration files to a selected position of an existing or empty destination archive. Renaming archives, banks and registrations. PSR MIDI Properties (PSRMIDI) is a tool that scans GM, GM2, XG and XF MIDI-files of format 0 or 1, style-files for Yamaha-keyboards and Cakewalk XG-SysEx bank-files. You will get an interpretation of all elementary midi-events included. The program has been developped to get knowledge about the interior of the songs which are produced by the Yamaha keyboards with its special XG-SysEx and voices, but it can also be applied with all other XG, GM and GM2 MIDI-files. The type of protocolled events can be selected by filters. There is no manual needed with the program. Cakewalk Instrument Definitions (CW Ins-Files) Here are Cakewalk instrument definitions for some Yamaha keyboards to be used with the sequencers Cakewalk/Sonar and the MIDI file utility PSRUTI. The files are free to use and distribute. Files are available for YAMAHA PSR-8000, PSR-9000, Tyros, Tyros2, Tyros3, Tyros4, Tyros5, PSR-3000, PRS-S700/900, PSR-710/910, PSR-K1. Cakewalk StudioWare Panel Software (CW Studioware). The plugin-software "StudioWare Panels" for Cakewalk/Sonar are graphical user interfaces (GUI) to be loaded with the sequencer-programs Cakewalk or Sonar. Basic Voices is a pdf-file with a voice-list of the the GM, the XG-Bank 0 and panelvoice-bank 112. PanelVoices is a MSWord document with a list of the original melody voices (banks MSB=0, LSB=112,113,...,126) of the PSR-8000, the PSR-9000 and the 9000PRO. "Die Ablage von MIDI-Files des PSR-8000" is a pdf-document with some findings about the structure of song-archives, stored on floppy-disk by the PSR-8000. "Structure Of Registration PSR-2000" is a pdf-document with some findings about the structure of registrations created by the PSR-2000. The VoiceRevoicer is a tool to change voices in voice files. Voice files are copies of native voices of the YAMAHA keyboards since Tyros. If we apply the YAMAHA keyboard as master and an expander, synthesizer or another keyboard as slave, it will be advantageous to revoice voicefiles with native voices of the slave and to assign these to voice parts like Right1 at the master. With an appropriate MIDI Setup we are able to generate the native sound of the slave. InsFileChecker is a program to check the consistence of labels of Instrument Definition Files used by the Sequencer Cakewalk/Sonar and PSRUTI. The freeware MIDI File DLL "HP MIDIFILE" includes functions to load MIDI Files or create new ones, to read, insert, delete, change all MIDI Events of GM1/GM2 and of YAMAHA XG/XF. With functions Select, Copy and Paste sets of events can be inserted at other timepoints into the same or another MIDI File. There are functions to find and select MIDI Devices and to play the loaded song. 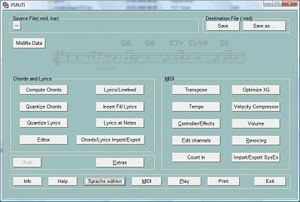 HP MIDIFILE is intended to simplify the creation and editing of MIDI Files. Most of the functions work with the logic of events, not with internal data. HP MIDIFILE also offers functions to read items of Cakewalk/Sonar Instrument Definition Files. The user of this library must be familiar with the structure of MIDI and MIDI Files. Applying YAMAHA SysEx and Meta Events he should look at XG and XF specifications. A lot of good documents can be found in the internet. HP MIDIFILE is mainly implemented for the programming language Visual C++ for Windows of all versions: Win98, Win2000, XP, Vista, Windows 7. Based on HP MIDIFILE I have programmed the freeware application PSRUTI.